New Portsmouth manager Paul Cook says he expects midfielder Jed Wallace to leave Fratton Park. 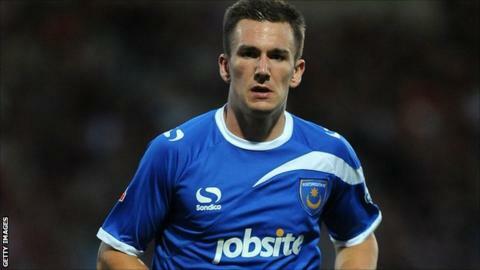 Wallace, 21, scored 17 goals in 50 appearances for Pompey last season and has been linked to several clubs. Cook, who was appointed on Tuesday, says he has met with the player who is now mulling over his future. "It's down to Jed," Cook told BBC Radio Solent. "I met Jed the other day but if the truth be known Jed's future will be somewhere else now." Wallace came through the club's academy and Cook says the player's decision must be respected. "I don't want to annoy Portsmouth's supporters and I don't want to annoy Jed Wallace but Jed has given the club two years now," he added. "He could have moved on in windows gone by but Jed will make that decision. Certainly I respect Jed's decision because he has been one of the shining lights at this football club." Cook says he has made a decision on the 11 out of contract players at Fratton Park but not all have been informed of their futures yet. The former Chesterfield boss also says he has set a target of promotion for the League Two club, comparing football to a jigsaw. "It was a tough decision (to leave Chesterfield) but sometimes you have to make big decisions in life," he said. On his targets, he added: "Just to win promotion, in a year's time if we are promoted everyone will view that as a good season. "Football is like a jigsaw, the more pieces you get correct the easier the job is. At Chesterfield I was lucky enough to build a team and luckily we got many of the jigsaw pieces right and all of sudden we become a good team and it it'll be the same process at Portsmouth." Cook also says he plans to speak to former Pompey manager Andy Awford - who was sacked in April after a year in charge of the club. "I will do, sometimes things can be a bit raw," he said. "I do know Andy, I wouldn't class him as a close friend but he would be a friend and I know with Andy it will hurt. What I do know is that they love this club."